Many people attest that cooper cookware can be one of the best culinary metals making it a staple at home. Because of property as a great heat conductor, the heat that is transferred is even from the base up to the sides. The uniform distribution makes it possible to cook the food uniformly from the bottom up to the top. The drying of moist foods is very minimal. It also cooks the quickest, which is a testament to some people who have used it. The best cooper cookware is now available in the market. All you need to do is to select the top on the list and pick depending upon your budget. Here is the list to give you an idea of what you want based upon your requirements. Le Cuivre Copper Tri-Ply 7 Piece Cookware Set has a 2.8 quart of covered saucepan, 2 quart covered saucepan which is the smallest, saut? pan that is 9.5 inch and a casserole pan with a size of 6.25 quart and comes with a cover. The pan that comes with this set is “tri-ply”. It means that the inside material is stainless steel, and the material outside is copper and the aluminum is put in between for more heat conductivity and pot strength. Stainless steel is used for the lids. This is a good buy if delicate sauces are being created for an even heating. There is a lifetime limited warranty when you purchase this set. This set comes with a 7.2 inch saucepan that has a lid, 9.5 inch saut? pan, flared that also comes with a lid, and an 11 inch brazier that also has a lid and a 9.5 inch casserole pan that has a lid. 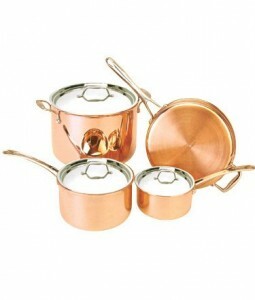 Solid copper is used for the construction of the pans and lids. It has stainless steel linings, which means that cooper will not touch the food. The downside of pure cooper is that they are heavy. The rims are drip proof so that the food will not run out. It has a tight fit because of the lids. It is easy to polish. It is a bit pricey but might come in handy when serving for a lot of people. 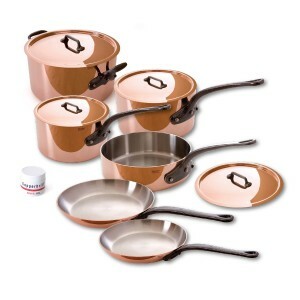 Calphalon Tri-Ply Copper 10 Piece Cookware Set offers 3 quart saut? pan with cover, two skillets-one 10 inch and the one is 8 inch, three saucepans with covered, 1 ½ quart pan, 2 ½ quart pan and a 6 quart pan. These pans are tri-ply. It means that the middle is aluminum, the material of the pan outside is copper and stainless steel is the material inside. Even though it is lightweight, there is a little evidence of copper in the set. Food sticks in the pan and it turns it to yellow. The lids are guaranteed stainless steel and there is a lifetime warranty that comes with the set. 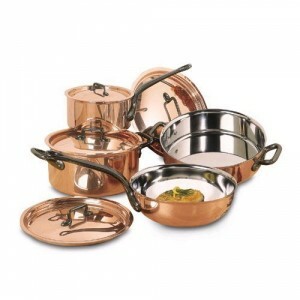 Mauviel M’heritage Copper Cookware is made of stainless steel and copper. The percentage is 90% copper and 10% stainless steel. The 3 types of M’hertage thickness are M250C, which has a copper skin of 2.5mm thick. It can be distinguished from the rest because of the cast iron. The next grave would be copper skin, which has a 2.0 mm thickness. The handle of this pan is stainless steel. The next grade is M150C. It has a copper skin that is 1.5mm thick. It has bronze handles. It has a non reactive surface because of the interior is made of stainless steel. The taste of food is preserved. There is no need to reapply stainless steel every now and then. This set can be used with electric stoves or gas. It can also be put in the oven. Next Next post: Sickle Cell Anemia Facts – A disease to be worried about?